I am an English Language (elementary level) and Portuguese Language teacher. I teach at a public school in Portugal. I hope you´ll find my "stuff" useful! Thank you for sharing!! 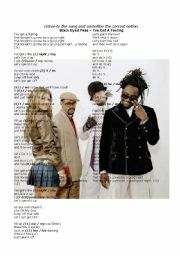 Ss listen to the song «I´VE GOT A FEELING» by BLACK EYED PEAS and underline the correct option of some of the words in the lyrics. By doing this exercise, Ss practise the following: the present simple of the verb to be, possessives and days of the week. On the second page, there´s the full version of the lyrics. 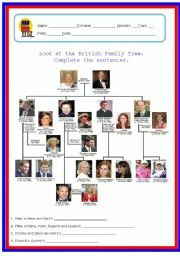 Ss look at the British Royal Family tree and complete the 22 SENTENCES according to it. The answer key is in a PPT presentation in http://www.eslprintables.com/powerpoint.asp?id=24919#thetop. Hugs from Portugal. Ss look at the Family tree and complete the 22 SENTENCES according to it. The answer key is in a PPT presentation in http://www.eslprintables.com/powerpoint.asp?id=27898#thetop. Hugs from Portugal. 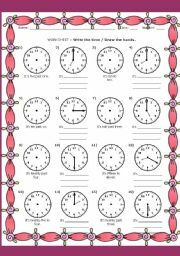 Ss write the time and draw the hands. Ss look at the Family tree and complete the 21 SENTENCES according to it (with ANSWER KEY). There is a related PPT presentation in http://www.eslprintables.com/powerpoint.asp?id=25264#thetop and another WORKSHEET in http://www.eslprintables.com/printable.asp?id=389661#thetop. Song: THIS IS HALLOWEEN. Ss listen to the song and complete the lyrics with the given words. Then, they match the numbers of those words with the pictures. On the 2nd page you can find the ANSWER KEY and the youtube link: http://www.youtube.com/watch?v=jU6iP0WLsU8. 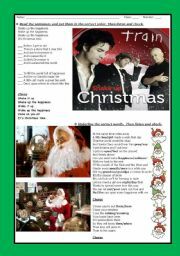 A nice CHRISTMAS SONG by Train that you can find in http://www.youtube.com/watch?v=J-8VCL4uSUc. SS are asked to do THREE TASKS: Read the sentences and put them in the correct order; Underline the correct words - Then, listen and check. On the second page there is the youtube LINK and the COMPLETE LYRICS. Ss look at the Family tree and complete the 22 SENTENCES according to it (with answer key). 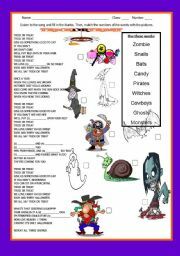 There is a WORKSHEET with the same family tree and sentences in http://www.eslprintables.com/printable.asp?id=416476#thetop. Enjoy your Sunday!! Ss look at the British Royal Family tree and complete the 22 SENTENCES according to it (with answer key). 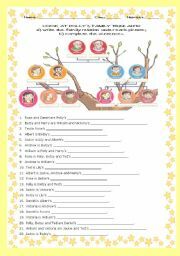 There is a worksheet with the same family tree and sentences in http://www.eslprintables.com/printable.asp?id=386117#thetop. Hugs from Portugal. Each slide has one different letter. You can read, sing the english alphabet (26 letters) with your Ss. I hope you´ll find it useful. Hugs from Portugal. Each word (I, you, he, she, it, we, you, they) is represented by a picture. I suggest that you write the meaning (in your Ss first language) of each pronoun on the line under each picture so that Ss can read / write the words in both languages. 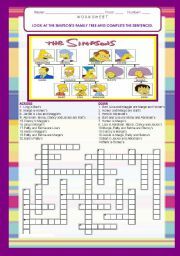 Ss look at the Spanish Family tree and complete the 22 SENTENCES according to it (with answer key). 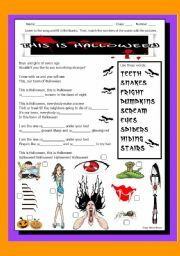 There is a WORKSHEET with the same family tree and sentences in http://www.eslprintables.com/printable.asp?id=390412#thetop. Filling in blanks in sentences using the verb to be (affirmative, negative, interrogative) - with answer key. Ss order the words and build sentences using the present simple of the verb to be (affirmative, negative, interrogative) - with answer key.